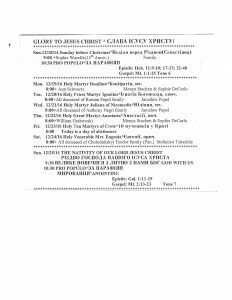 There is only 1 Divine Liturgy on Christmas Day at 10:30 a.m., in English and Ukrainian. At 9:30 a. m. there is a “God with Us” service. We can catch a glimpse of the Spirit of Christmas as we savor the fellowship enjoyed by our families whose members gather from far and wide to be together for our Christmas Eve Holy Supper. And yet, such fellowship is but a shadow of that divine fellowship enjoyed by all mankind as a result of the Birth of the Second Person of the Most Holy Trinity. “To all who did accept Him He gave power to become Children of God” (Jn. 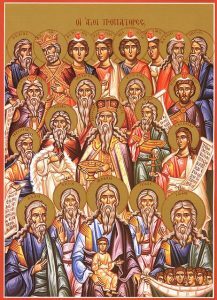 1:12) indicates a radical change which this divine fellowship entails: God became human so that human beings might become like unto God. Therefore, the celebration of Christmas ought to raise certain questions for each one of us. How is my personal life affected? How does the Christmas Event relate to our society with all its challenges? If we travel mentally around the world, what do we see? Violence of all sorts, physical and sexual abuse, violation of the rights of the unborn and defenseless, unconcern for the poor and migrant, abandonment of children and the elderly, the unjust aggressions suffered by Ukraine, the horrific massacres in the Middle East and Africa, are a fraction of our society’s illness which should cause us to wonder if the story of Christmas will ever succeed in getting across to all people its principal message. That message is simply that the salvation of each of us must be through love and in love. This fantastic message of Christmas is, for very many, the greatest secret still yet to be fathomed: God’s love for all has been revealed in the Word made flesh! As we move toward Christmas, the Sunday before the great feast of the Lord’s Incarnation is day when we read the gospel giving us the genealogy of Jesus. The Gospel this Sunday presents us with an abundance of names, all those who were the ancestors of Christ. By this we see that on this feast, the Son and Word of God becomes a part of the human family and a part of human history. In this Gospel Jesus is also given a name, the final verse tells us that the child will be known as Jesus – Savior. In verse 22, though, he is given the name “Immanuel,” “God with us.” This gives us the theological meaning of the feast, the incarnation signifies our deification. We all have names, but for the ancients, names had meanings, they did not simply give us an identification tag, but told us something of who we were. In that sense, we do not name ourselves, but we are given a name, we are all “called by name” by God, and so we enter into the ancestry of Jesus. The names are the forefathers of Jesus, but also the foremothers are mentioned: Tamar, who bore a son by trickery of Judah; Ruth, the grandmother of David, who left her people to follow Naomi; the unnamed wife of David, Bathsheba, who David married by arranging for the death of Uriah. We see, then, that even trough questionable and evil actions, as well as by faithfulness, Jesus becomes “the son given to us.” The greatest of the woman in his genealogy is, of course, Mary, his mother, who by her obedience cancelled the curse of Eve, and united God with humanity in her womb. Today, we celebrate the Son of Abraham, according to the Law, and the Son of David, the everlasting King, to whom even David bowed, and even the Son of exile, for we are all citizens of the spiritual, not the earthly, Jerusalem. Today we must be named as a follower of Christ. How are you doing with preparing for the great feast of the Nativity of the Lord with the 40-day Philip’s Fast? 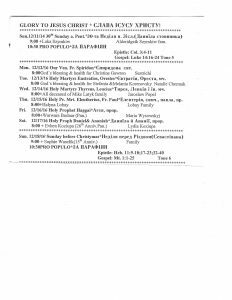 Several weeks ago there was a post here on the Philip’s Fast and encouragement in the spiritual preparation by the bishops of the US Ukrainian Church. Here is another post on this important 40-day preparation. Make plans for some delicious pierogies in December: call to place your order soon! Call your order in by December 13th. This first phrase from today’s Epistle as the Church begins it’s celebration of the birth of our Lord really tells us what Christmas is all about. This is the announcement of the feast. The Word of God, appearing in our world, is the glory of the believer. He appears in humble surroundings, but invites all to the feast! The gospel (Luke 14:16-24) tells us that those who are well off refuse the invitation, but it is “the poor and the maimed and the lame and the blind,” who come, it is those in “the highways and hedges” who are “compelled to come.” Mary probably realized this when she prophesied, “He has put down the mighty from their thrones, and exalted the lowly.” (Luke 1:52) The angels appear to the shepherds in the fields, and they are invited to the house of the Lord. The glory of the Lord is his humility, and our glory is our humility. For all that, everyone is invited to the banquet, and the wise and the rich from Persia come with expensive gifts, though they too are outsiders, and the epistle tells us “there is neither Greek nor Jew, circumcised nor uncircumcised, barbarian, Scythian, slave nor free, but Christ is all and in all.” (Colossians 3:11) Those who welcome Christ will put aside “anger, wrath, malice …. ” (Colossians 3:8) The first sticheron at Christmas chants, “let us proclaim the present mystery by which the partition has been broken and the flaming sword withheld. Now the Cherubim shall let us all come to the Tree of Life.” This is putting Christ back into Christmas! 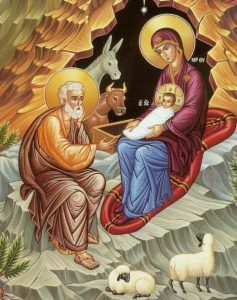 The Divine Liturgy will be offered on Thursday, December 8th at 9:00 a.m. for the feast of Conception of St Anne [also called the Maternity of Holy Anne]. It is a holy day. In the Roman Church, the feast is called the Immaculate Conception of Mary. “With the Angels let us celebrate the aIl-glorious conception of the Mother of God” (from the Office of Matins). Holy Scripture does not about about the birth and infancy of the Blessed Virgin Mary. The early Christians believed, based on the Protoevangelium of St. James, a document compiled by an unknown author in the middle of the second century. In this text the birth of Mary was considered as miraculous in manner that we consider the birth of St. John the Baptist to be. More about today’s feast can be read here.